Banner of the Damned is a recent fantasy novel in the Sartorias-deles world by Sherwood Smith. While Sherwood Smith has also written middle grade and young adult novels set in this same world, this is an adult novel set in the historical era. It is set approximately 400 years after the Inda books comprised of Inda, The Fox, The King’s Shield, and Treason’s Shore. Despite its relation to these books, it can be read as a stand alone, although I suspect I would have gotten more out of it had I read the Inda books first (which I do now want to read because I really enjoyed Banner of the Damned!). First Rule: Do not interfere. Second Rule: Keep The Peace. The entire novel is her defense testimony, which details her life, the events leading up to her failure to keep the scribe’s rules, and the reasons for what she did. It begins with an important day when she is fourteen years old. As a punishment, Emras was removed from the rest of the children in training to be scribes and sent to work in the kitchens. On this particular morning, she was awakened in order to join the other scribes for testing. Later that day, she learns the scribes are beginning to consider the best student to one day become personal scribe to Lasva, the beloved princess of Colend. Emras applies herself to her studies and is eventually chosen to work for Princess Lasva, who requested a scribe close to her own age. This allows her to see Lasva’s trials and tribulations firsthand and eventually brings her to Marloven Hesea, a country of warriors possibly plagued by dark magic – where she makes the choices that lead to her imprisonment. Sherwood Smith’s books have been on my radar for awhile, but I was never quite sure where to start. 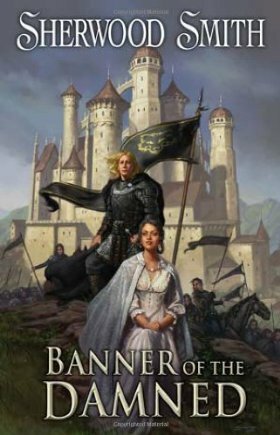 When Kate Elliott was talking about how much she loved Banner of the Damned on Twitter, I decided to start with that one. Since it is my first book by Sherwood Smith, I can’t say if it’s the best place to start or not, but I can say that it has made me more eager to read her other books. I enjoyed it immensely and think it is one of the better books I have read so far this year. It came as no surprise to me to learn the author has been writing about the Sartorias-deles setting for a long time given the richly detailed world in this novel. It’s not flashy fantasy with magic bursting everywhere and swordfights breaking out every 20 pages (although there is magic, especially in the second half and a little bit of fighting!). It’s more mature fantasy with a world-building focus on cultures – both how people interact with each other in the context of their own cultural constraints and how they interact with those with other cultural values. The first half of the book is mainly focused on Colend, the country Emras and Lasva reside in. Colend is a very peaceful nation characterized by civility and subtlety. The people add nuances to their communication through gestures and body language, and their conversations tend to be very polite on the surface even if there are barbs underneath. This nation is shaken up by the king of Chwahir, who was treated unkindly by the people of Colend with one exception – Princess Lasva, who is kind and attentive toward all. When he decides he must have Lasva for his own, it shatters the peace they are accustomed to and introduces change into their way of life. A third country, Marloven Hesea, also plays an important role in the story and its people also share different values and attitudes than those in Colend. While there are fleshed out, vividly real cultures in this novel, it is also about the lives of its characters – from their everyday activities to the importance one person can have on the fate of many. Emras documents everything from her scribe training and placement as scribe to the princess to the people in court to the bigger events that took place. It demonstrates the domino effect events can have since many different occurrences put her in the position that lead to her imprisonment, particularly as related to actions taken by others and how they influenced Lasva’s eventual path. The characters themselves had me feeling a bit conflicted at first since I thought they had an uneven ratio of good to bad qualities. For instance, Lasva is exceptionally beautiful and kind, and Carola is vain, arrogant, and selfish with no good quality I could see. Yet they did work for me, and this was because they each had different characteristics and qualities so none of them were “good” or “bad” in the same way, making them seem more like the average person who leans toward one side of that spectrum. They also had experiences that fleshed them out. In addition to her epic beauty and kindness, Lasva still had unpleasant memories and grief in her life, and the way she reacts to situations gives her enough humanity to keep her from being obnoxious or completely unbelievable. As a young woman, Lasva could also be naive so she was not perfect despite her innate goodness and she was a character I could empathize with. She and Prince Ivandred both managed to make an emotional impact on me. However, the one drawback was that Emras did not manage to have that effect on me despite being the narrator and the character whose viewpoint we see most intimately. That’s not necessarily a bad thing since it is completely in keeping with the character of Emras and her scribe nature. Despite the personal nature of her account, she is a trained observer who keeps her distance and not someone overly emotional. That’s not to say she doesn’t have feeling or empathy since she certainly was upset when shunned by her cousin or when Lasva was unhappy. She is very practical and logical, though, and this does carry over into her voice in a way that kept me from being truly worried about Emras despite knowing something terrible must have happened to her from the very first page. Banner of the Damned is one of my favorite books read this year. Though not lacking conflict, it is a novel that has many quieter moments but comes together beautifully in the end to show the greater impact a few people and a series of events can have. The cultures were wonderfully developed and so were the major characters, who each had their own distinct attributes and roles in the imprisonment of Emras – and her writing of her testimony. Highly recommended for fans of thoughtfully written fantasy stories with complexity beneath the surface.